The JD-XA is unique and inspiring and wears many hats admirably. Time to get saving! Blending the analogue and digital engines results in distinctive new sounds. The front panel is a tweaker's delight. Plenty of modulation, a decent sequencer, arpeggiator, flexible effects, plus a great Vocoder. Back panel attracts glare from lights. We'd have preferred a five octave keyboard. Back at January's NAMM show, we first set eyes on Roland's JD-XA 'crossover' polysynth prototype and it certainly got everyone talking with its space-age slider laden red-backlit front panel. The prospect of a new Roland analogue polysynth has unsurprisingly had synth-heads drooling in bucketloads and, with Roland's solid legacy of polyphonic analogues (including the now classic Junos and Jupiters), the JD-XA obviously has a lot to live up to. Well, at last the JD-XA has arrived at FM HQ and it's time to get the lowdown! "It's a godsend having so many real-time controls on the front panel and hugely practical that they're backlit"
The JD-XA arrived in a very unassuming cardboard box with a large black and red graphic of the synth printed on the side, but little can prepare you for how great this synth looks in the flesh. Straightaway, the JD-XA's lineage is clear with design cues taken from the now vintage slider-laden JD-800 and also from current Roland synths including the FA series. We've seen some folks complaining on forums about all the red lights and how gimmicky it looks but it's a godsend having so many real-time controls on the front panel and having them backlit (like the TR-8) is hugely practical for on stage and in dark studios. Many times on gigs we've struggled to see a synth's front panels when the lights are down between songs and we wish more synths had front panels like this. For those that are dazzled by the lights, you can simply turn them off or choose to light up certain areas of the panel (such as the envelopes or filter controls). The control panel is very easy to navigate, though there's a lot to take in on first glance and it does take some time to get accustomed to the features/ layout. One small downside is that, though the glossy black panel looks classy, it does attract fingerprints (and potentially scratches) and reflects glare from studio/stage lights which can make the panel hard to read at times. Build quality is good, although for the money we were expecting a big upgrade from the feel/quality of the JD-XI but it's largely the same - save for two strips of brushed metal on the front and back edges of the control panel to add rigidity. Next to a Prophet 08 with its metal/wood case and the Analog Keys which is built like a tank, the JD-XA feels less substantial but it's still more than solid enough. One upside to the plastic case is that the XA is very portable and, importantly, all the switches, faders and dials feel sturdy. Now onto the keyboard and controls. Firstly, the keybed feels great and is pretty similar to my Alesis Andromeda's (which is one of this writer's favourite synth-action keyboards). What we especially like is the shallow travel/ trigger point which allows you to play very fast and accurately, plus, as the keys are not too heavily sprung, they're perfect for playing fast/intricate chords and solo parts. In addition, it's great to have aftertouch for triggering modulation and the aftertouch curve can also be customised. 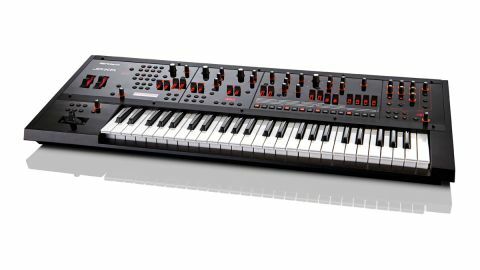 In keeping with many classic analogues, we would have preferred the JD-XA to ship with a five-octave keyboard instead of a four-octave one, especially as there are some really flexible splitting and layering options onboard and each of the eight parts (four analogue/ four digital) can have its own note range/zone mapped to the keyboard. This shorter keyboard could become an issue if (for example) you wanted to assign a mono analogue bass sound to cover the bottom three octaves (to mimic a three-octave monosynth) - if you do that, it only leaves an octave left for your other sounds. The alternative is to reduce your bass zone to two octaves and leave the upper two octaves for your right hand. "As a comprehensive MIDI control surface/USB MIDI interface, the JD-XA can be the nerve centre of any studio or live rig"
This won't be a downside for everyone (and obviously a shorter keyboard equals more portability/less space taken up), but for somebody wanting the JD-XA to cover all their synth parts simultaneously it's a consideration, (though you could hook up a longer external MIDI controller board to control keyboard zones/parts as they all operate on independent MIDI channels). Control-wise, the XA scores highly and finally things have come full circle from the sparse Jupiter-50/80. All major sound-sculpting parameters are there for instant grabbing and it's great that Roland has included not just its standard mod/bender but also separate assignable pitch and mod wheels too (you can use the bender for performing and leave the mod wheel up for continuous modulation). The only thing lacking is a data entry/jog wheel as (like the JD-XI), when accessing deeper menu/programming functionality (particularly on the digital side), you have to input values using plus/minus buttons which can become tiring (though you can scroll in tens by holding shift down simultaneously). With all those dials and sliders onboard it would be criminal if the JD-XA couldn't act as a comprehensive MIDI control surface/USB MIDI interface - thankfully it does and all the sliders/dials send and receive MIDI CC data (as well as the program selectors) and each slider/dial CC can also be configured manually to talk nicely to your own MIDI gear or plug-ins. This means that the JD-XA can be the nerve centre of any studio or live rig; more so when you consider that it outputs CV/Gate and that the sequencer tracks also output MIDI too. The XA has two distinct sound engines (like the JD-XI), except this time they're much more comprehensive. The analogue engine has four parts with two oscillators per-voice and each part can run as an independent two-osc monosynth or you can engage Polystack which takes any one of the two-osc analogue monosynth parts and turns it into a four-note polyphonic analogue synth. Note that, when running in mono mode, you can stack all eight analogue oscs together across the four analogue parts, with two different waves and filter/envelope settings on each of the parts for extremely rich/varied sounds. You can also set up separate two-osc sounds on each part within Polystack mode and choose which part is the main focus for your 'polystacked' sound using the 1-4 'on' buttons (the focused part turns yellow which essentially allows you to have four separate poly sounds ready to go within a single Program). "The true potential of the 'crossover' concept becomes apparent, with new and unique sounds positively falling out of the JD-XA!" It's a nicely flexible system, though it does take a while to get your head around the many permutations! In order that you don't lose your head when editing, the Select buttons turn blue to denote which part(s) are being edited. The analogue engine sounds impressive - warm, full, yet tight and refined with a familiar classic Roland flavour - and the filter response and general quality is a big step up from the JD-XI. The onboard waves (saw, square, pulse/PWM, triangle and sine) sound solid, giving the filters plenty to chew on, plus there's white and pink noise for making sound effects and drums. The analogue filters are sonically versatile and there's everything you'll likely need to sculpt most sounds, though the four-voice analogue polyphony can feel restrictive if you're used to playing left-hand basslines with four-note chords in your right hand simultaneously. LPF1 (Roland) and LPF2 (transistor ladder) are 24dB types, with LPF1 sounding a little smoother/darker and LPF2 sounding livelier/brighter in the tops, while LPF3 (plus the BPF and HPF analogue filters) are all 12dB/octave types and they all share the same unhinged resonant character for making twisted/dirty sounds. In addition, there's a separate HPF after all these filters for rolling out excessive lows, plus an analogue drive circuit before filtering too - there's also a Master EQ on the output and per-part! So you can easily fine-tune your sounds to fit any musical scenario and the JD-XA can recreate classic analogue patches of yesteryear (albeit only four-voice ones), yet it can also sound very fresh/futuristic when combining the analogue and digital engines. Now the digital section. There are four parts with 64 voices available between them. It's basically a cut down FA-series engine and consequently it's compatible with the Supernatural Synth Tone library on Roland's AXIAL website. Like Roland's other current VA synths, each of the four digital parts has three partials (oscillators) available and each can have its own VA wave including saw, square, tri, sine and supersaw (all with several variations and waveshaping), plus noise sources and 14 digital filter types. Roland's Supernatural Synth engine is one of our favourite sounding VA's - however, layer the VA waves with one or more analogue parts and the true potential of the 'crossover' concept becomes apparent, with new and unique sounds positively falling out of the JD-XA! Also, layering up to 12 of the 450 onboard PCM waves with the analogue engine is fun and it's inspiring trying out unorthodox combinations (for example sax layered with an analogue bass, piano, noise and a bell wave! ), though obviously the more parts you add, the more overall polyphony is reduced. Finally, using the Aux section to send noise, the mic input and the digital parts via the analogue filters yields even more interesting results. Surprisingly, when playing an eight-note chord with two digital parts layered with a poly-stacked analogue sound, voice-stealing is seldom noticeable. Despite some minor qualms, the JD-XA is greater than the sum of its parts. It can be a great analogue and great digital synth but combine the two engines with the powerful onboard effects, filters and modulation facilities and some real magic happens. In an age where it's hard to be original, Roland's out of the box thinking has paid off - hats off to them for making one of the most inspiring and unique- sounding synths of recent times.